A few years ago, I never would have thought that I would be starting my own business, designing prototypes, and coming up with an idea that could change the world. Before, whenever I tried to come up with a great idea and have that “apple on the head” strike of brilliance, or sat down to have my epiphany, my head went blank. Coming up with an idea or solution doesn’t just happen: it is a process and a journey, and once you have your idea—well, where do you go from there? Over this blog series I am going to tell you my journey through this process—how to brainstorm and how to design and prototype, and—once you have an idea and vision—how to get it off the ground to help the most people you can. I’ll also share my progress in my personal entrepreneurial journey. Pretty Brainy’s Textiles + TechStyles™ workshop was all about trying to solve a local problem using the design thinking process. (Textiles and TechStyles was made possible by a wonderful grant from the OtterCares Foundation.) The problem I wanted to try to solve is how many kids get sick from the common cold each year. I wanted to find a way to help prevent this so kids do not have to miss school and other fun activities. My solution is simple: make it so kids fully wash their hands for the needed 20 seconds to help prevent the spread of germs and thereby sickness. Teaching the Teacher: Bee Pettner in 2016 at the International Society for Technology in Education. 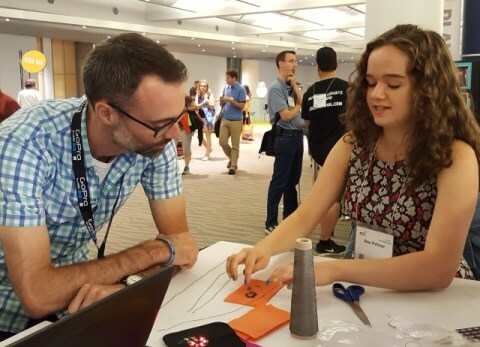 Bee was among the teen innovators with Pretty Brainy at the conference teaching teachers how to build eTextile circuits. She is now launching a start-up from a prototype she designed in a Pretty Brainy workshop. I was encouraged to pursue a patent for my idea and to start reaching out to companies, as my idea is something that can help a lot of people on a large scale. Through research, however, I found out that a patent isn’t right for me. I will talk about this in a later blog post. Through lots of questions, research, and time to think, I decided on this plan: to start my own LLC (limited liability company) called Bee’s Healthy Hand Habits and start researching and reaching out to companies that would be interested in developing and implementing my idea in large commercial building such as schools, restaurants, airports, amusement parks, and other places that would have a large impact in preventing the spread of sickness. But it doesn’t stop there. Bee’s Healthy Hand Habits, LLC, will be devoted to education of proper hand washing and helping to stop the spread of sickness through purifying water in third world countries. In elementary schools, there will be educational posters and lessons about what sicknesses can do and how just simply going through the hand washing cycle can directly lower the spread of colds. Also, a percent of all profits will be donated toward helping purify water in third world countries. Each device will count up how many gallons of water users have helped purify across the globe, continuously counting up the impact that their community has had. If I would have sat down and tried to think of a solution to purifying water in third world countries or a way to prevent massive outbreaks of common sicknesses, I probably never would have come up with something like this. The key that I found to coming up with a solution to a big problem is to think big by thinking small. Start with a problem in your community and try and solve that problem. Start with empathy. Don’t tell the person who is struggling what they need to fix their problem, but ask them what they need. Evolve your idea. If you find that it doesn’t work, tweak it and try again. Reinvent, don’t get discouraged, and always, always make helping someone’s needs the first priority. Think big by thinking small and soon you are not only solving that problem in your community, but the same problem that 30 other states deal with and the same problem a number of countries deal with, too. If you are flexible and grow your idea, it can be anything, do anything, and solve anything you want it to. I started this journey just wanting to help make hand washing a little less boring for kids and help prevent some spread of colds in schools, and I ended up having a vision that could not only impact my community and not only the country, but the world. By simply letting your idea grow, you can solve a problem you never dreamed of being able to solve. Over the next few blog posts we’ll explore the process of inventing and implementing your idea, and I will share my experience along the way. Editor’s Note: For the next post in this series, see How to Develop an Idea for a Business Part II. Isabella (Bee) Pettner is a senior at Colorado Early Colleges in Fort Collins, CO, who is concurrently earning a high school diploma and an associate’s degree of science. Bee will graduate in May 2017. She is in the process of launching a start-up called Bee’s Healthy Hand Habits, LLC, and is the owner of The Bee Sting, a shop that specializes in elegant and edgy fashion on Etsy. She has been part of Pretty Brainy for the past two years as a member of the design teams for Pretty Brilliant™, an engineering project benefiting Habitat for Humanity, and Textiles + TechStyles™. Bee loves inventing, engineering, designing, fashion, and math. She plans to attend Colorado State University beginning in fall 2017 and major in apparel design with a double minor in saxophone and business.